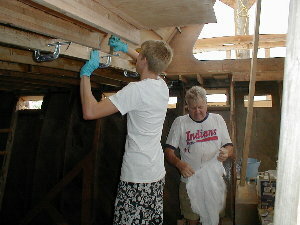 June 15, 2001 As both the mosquitoes and the shrimp begin to make their summertime appearance, the Cherokee crew makes quite a bit of headway. 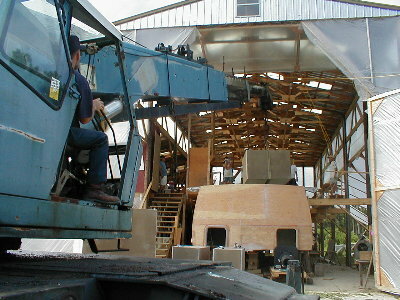 The fuel and water tanks were lifted by crane and successfully installed. (Our normal crane operator, George Brown, was unable to do the job because of a bad mulleting accident which left him severly cut by his boat propellor. He’s been in the hospital for a week, but is now home and on the mend.) 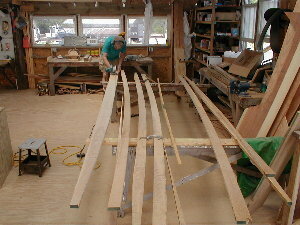 The water jets have been fitted to the transom by Leonard, and the oak collars are being fiberglassed in place. 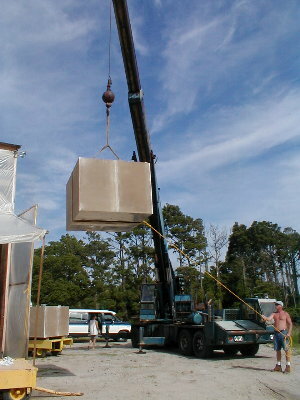 We can’t leave out the amazing Thermapure System, able to macerate (is that legal in North Carolina??) waste and heat it to a temperature that renders all micro-organisms dead. The Coast Guard will be glad to know that it processes a product that results in zero parts per million discharge, whatever that means. Drum roll please… Jeanette broke new ground in the project by starting the finishing process in the V-berth. That’s right, FINISH CARPENTRY! The faring she is doing is the last step before the final painting. When she completes this, Jeanette will put up paneling and ceiling. This will all be painted, and trimmed in varnished mahogany. 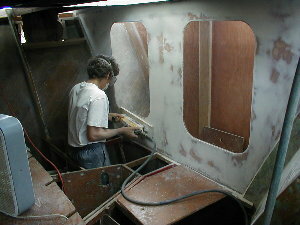 Meanwhile, Jim is busy fitting panels in the aft bunkroom. These panels will be taken out of the boat and fared on a flat table, where the work is much easier and faster, and then re-installed. 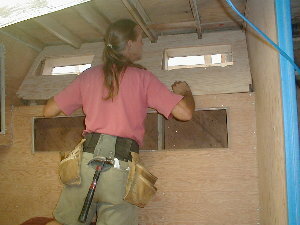 Norm and Brooks have installed five deck beams in the forward stateroom area. This process took about two days. They are know doing the final epoxy coating in that area of the hull. 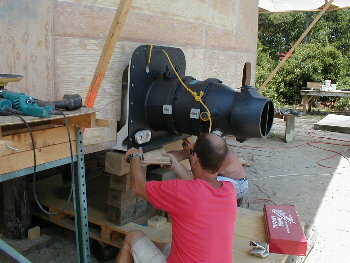 The waterjet project is moving right along, with Leonard at the helm. 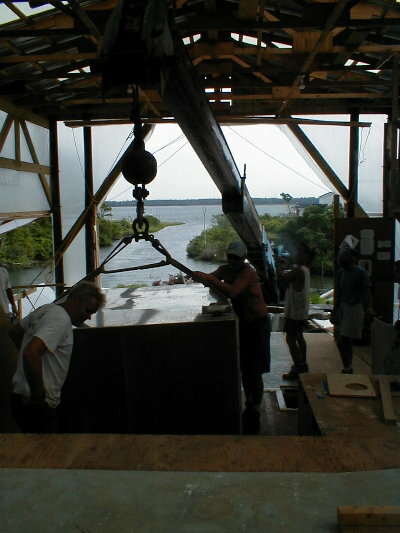 The process involves fitting the jet to the transom, measuring and fabricating oak collars for proper spacing, and fiberglassing all the woodwork into place.